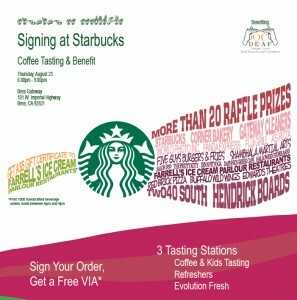 A Starbucks in Brea, California has scheduled an amazing coffee tasting event to raise money for the Orange County Deaf Equal Access Foundation! A partner emailed me, asking if I would help spread the word about her event, and of course I am happy to do that! When: Thursday, August 23, 2012, 6:00 p.m. to 9:00 p.m.
Local businesses in Orange County donated prizes, and proceeds from raffling those prizes will be donated to OC Deaf Foundation. There will be ASL interpreters at the coffee tastings, and it’s also an opportunity to try the new Refreshers, as well as the bottled Evolution Fresh juices. Also, there will be a giveaway of Via (supplies are limited) to those who sign their beverage orders! It looks like this will be a lot of fun. I wish I could be there! 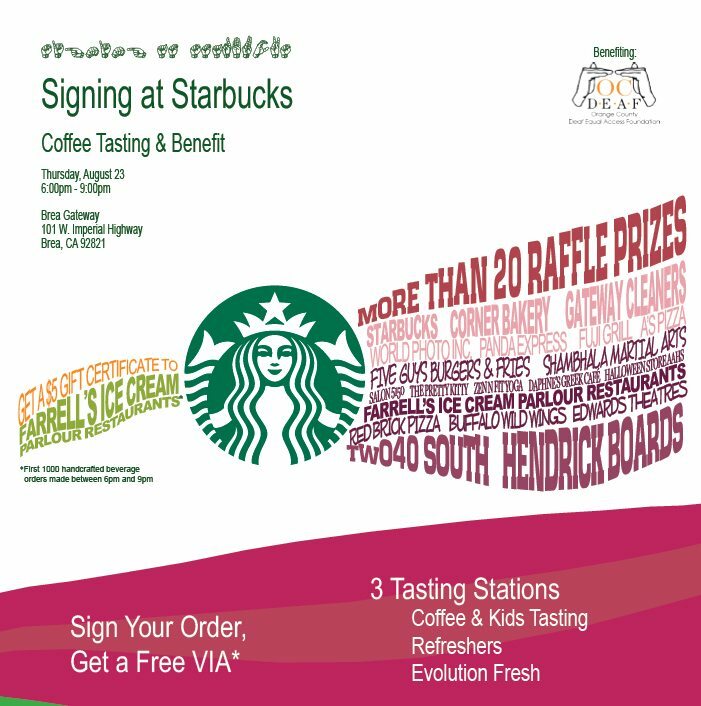 If you’re in the area, please support this Starbucks, and drop by on August 23rd! If you are interested, I had a previous blog article on a coffee tasting at the Olive Way Starbucks which was ASL interpreted. OMG I love this! I hope lots of people will show up. Unfortunantly I am close enough to go. Melody I wish more stores would do this. There is a terrific customer at my local SB that is deaf and the partners are just great in learning signing and communicating with her. I wish there was an ongoing training program for partners to be able to learn sign language. You have a barista that is Deaf at your local Starbucks? Where is that if you don’t mind me asking?